In an increasingly competitive reverse mortgage lending environment, more than ever, experienced originators are having to refine their sales practices in order to close loans. From the kitchen table to the call center, loan officers are focusing in on tried-and-true best practices. 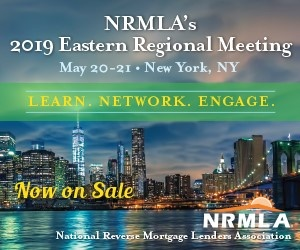 Several originators shared their tips during the National Reverse Mortgage Lenders Association Western Meeting last week. Make yourself known. Relative to the number of reverse mortgage eligible residents in the U.S., there are very few reverse mortgage experts. Even among forward loan originators who offer both forward and reverse mortgages, visibility is paramount in today’s market. Work with the adult child. The adult child of a prospective reverse mortgage borrower can be a major hurdle to any deal. Often coming to the conversation with abundant questions and scrutiny, adult children typically have done some research and have questions and notions based on the information they have gathered. Originators can work to address the scrutiny head-on by including the adult children in the meetings with prospective borrowers and asking for their questions upfront. Originator can then explain the misconceptions around the product or dispel any myths brought up by the adult children. Celebrate success. Within an organization, it’s important to focus not only on the challenges of the current operating environment, but the successes, says Don Giorgio, founder CEO and president of United Northern Mortgage Bankers, Ltd., based in Levittown, N.Y.
“Make sure you celebrate the success,” he says. “Celebrate with the person next to you, celebrate with the company. It makes you a happier person.” This, he says, will lead to more success. Positivity, too, goes a long way, Luddy says. Be an expert. Above all, it’s important to maintain expertise during this time of change. With several new rules, including those relating to loan terms and treatment of non-borrowing spouses, originator expertise is paramount. The same is true for overall education, Giorgio says. “Our biggest obstacle is not the client, it’s the public perception,” he says.